Recently a family member mentioned that caffeinated drinks affect him differently. He told me that he noticed a difference when he consumed coffee which has natural caffeine as compared to soda which has synthetic caffeine. I was surprised. I never thought about the fact that there could be a difference. I decided to investigate by doing some research and experimenting with drinking coffee instead of Diet Coke. In addition to caffeine coffee has vitamins, antioxidants, and other compounds similar to caffeine. These components balance the lift and fall of the caffeine in your system, preventing the instant jolt and imminent crash associated with synthetic caffeine. Synthetic caffeine is produced in laboratories and manufactured in factories. It is added to many products such as sodas and energy drinks. Synthetic caffeine does not include the the plant-based vitamins and nutrients found in naturally occurring caffeine, which may disturb a healthy balance. For my experiment I replaced Diet Coke with coffee for one week. I typically drink 6 ounces of Diet Coke in the morning. Because I am sensitive to caffeine I made sure the amount of caffeine in the coffee was the same amount in 6 ounces of Diet Coke. I did not add anything to my coffee. 6 ounces of Diet Coke has 22.5 mg of caffeine. Similar to Diet Coke, when I drank coffee I was a in a good mood, felt energetic and running seemed easier as compared to when I do not have caffeine. Coffee did NOT make me feel jittery like when I drink Diet Coke. My hands did not shake and I could focus on a task. 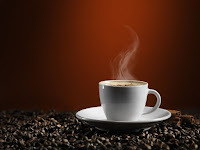 When I drank coffee in the morning I did NOT have an energy slump and feel tired later in the day. When drinking Diet Coke I usually felt tired in the afternoon. After drinking coffee I did NOT crave something sweet like I do after drinking Diet Coke. Based on this experiment I am going to continue drinking coffee instead of Diet Coke for my daily caffeine fix. If you drink soda and you don't like feeling jittery and crashing in the afternoon you should try coffee.